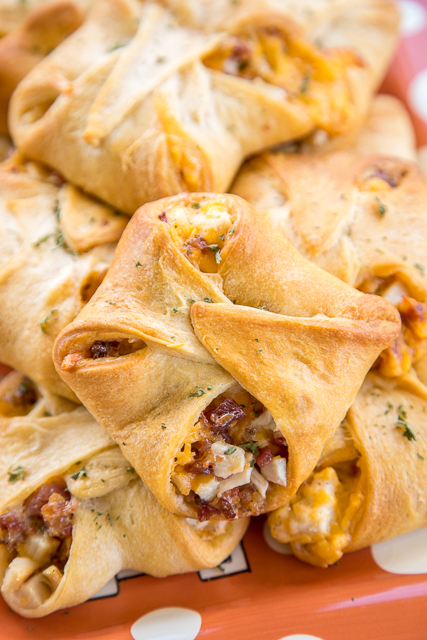 Chicken, bacon, cheddar and ranch baked in crescent rolls. SO addictive!!! I took these to a party and they flew off the plate. You might want to double this recipe. Everyone RAVES about this easy chicken recipe. Great for tailgating, parties, lunch and dinner. Can make chicken mixture ahead of time and assemble crescents when ready to bake. SO GOOD!!! Happy Football Friday!! We are about a month into college football. I hope your team is doing great!! If not, just focus on the tailgating! That is what I do! LOL! Today I'm sharing these Crack Chicken Crescent Bites. 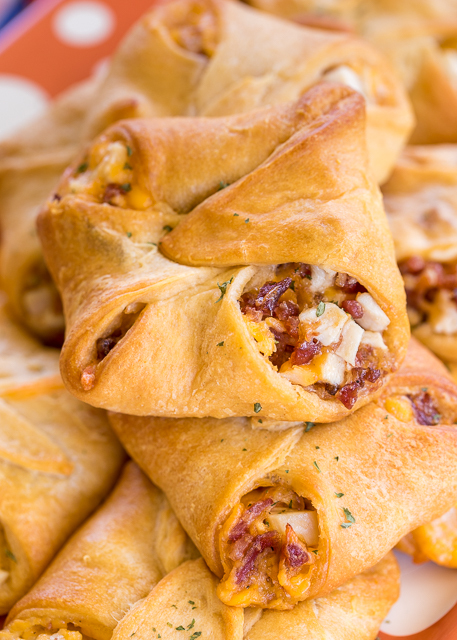 Chicken, cheddar, bacon and ranch stuffed inside crescent roll dough and baked. O-M-G!! SO addictive! I took these to a football party and they were gone in a flash. I should have doubled the recipe. Next time I will! Lesson learned. If you like to make party food ahead of time, you can mix up the chicken mixture ahead of time and assemble the crescents when you are ready to bake them. These taste great right out of the oven or at room temperature. You can even serve them with some extra ranch for dipping. YUM! I love how easy these Crack Chicken Crescent Bites are to make. They are also WAY too easy to eat! I ate more than my fair share of these! Too good. 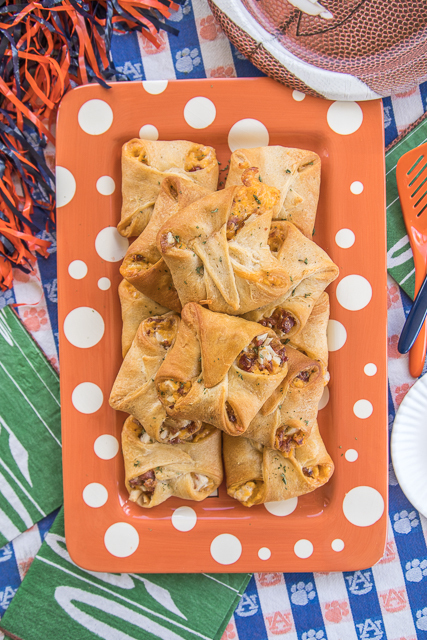 If you don't tailgate or watch football, these are great for a quick lunch or dinner too. 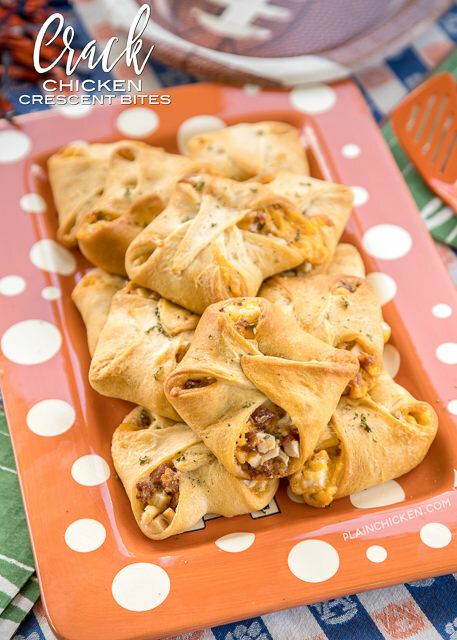 You really can't go wrong with these yummy Crack Chicken Crescent Bites! Preheat oven to 375ºF. Line baking sheets with parchment paper. Set aside. Combine cooked chicken, bacon, cheddar cheese and ranch dressing. Set aside. Unroll each can of crescent rolls. Press perforations to seal. Cut each sheet of crescent dough into 6 squares. You will have a total of 12 squares. Spoon chicken mixture onto squares. Bring 4 corners of each dough square up over filling; press edges to seal. Place on prepared baking sheets. Im making these now except i split the shredded cheese with cream cheese and also added chopped steamed broccoli! Have you tried these in an air fryer? Any tips?